Show me the staircase to Vintage Heaven! 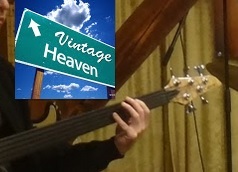 'Vintage Heaven' is the Youtube studio in the house of 'Vintage Guitar' Oldenburg. The opening took place in January 2016. The studio is available during the opening times of 'Vintage Guitar' for customers as a test space for guitars and basses . Once or twice a month we use the studio for recording sessions with bands of our choice and they will be published after sound- and video-mix on our Youtube Channel 'vintage Heaven'. Various videos are already 'in the box' and will be published in the following weeks. ...is available at YOUTUBE too. Simply click the picture and you are on the staircase to Vintage Heaven!